If you’re still running your programs and games off a hard disk, do yourself a favour and get an SSD. They’re (still) not cheap, but they’re the best way to make your PC feel fast and responsive. They’re silent, too, and take up less room in your case. 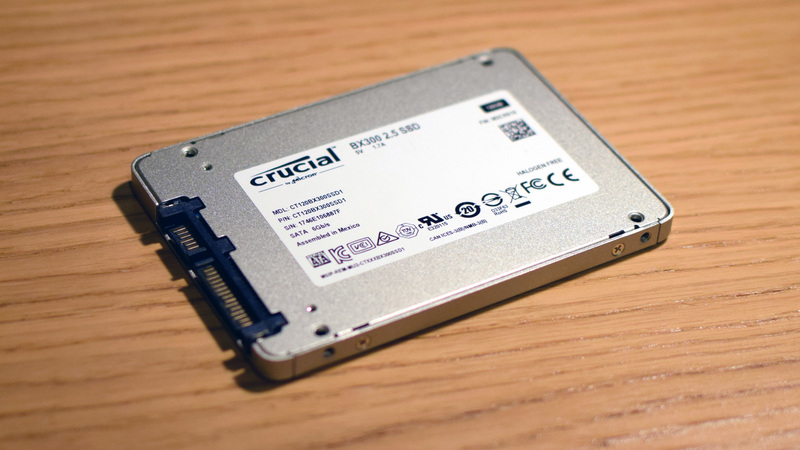 We’ve extolled the virtues of SSDs in our best gaming SSD list, but Crucial has sent me a potential bargain for review: the BX300. Now I’ll be upfront – prices pre-Christmas were much better than they are now, with almost all storage capacities costing around £10-15 less. As such, the 120GB model isn’t especially good value at time of writing. Even at its previous price of £44 (now £54), it worked out at 37 pence/GB (or 41 cents/GB if you’re in the US), which is the kind of figure I expect to see on premium drives. A 120GB drive is also a bit too small to be particularly useful – that’s the capacity Crucial sent me for testing, and I couldn’t even fit Doom and The Witcher 3 on it at once. The 240GB version is much more like it, although its current price of £79 (or $75) still feels like it ate one too many leftover turkey sandwiches over the holiday. Two weeks ago, it was just £65, working out at a far more reasonable 27p/GB. As a result, I’d recommend waiting for this to fall back down to this sort of price before you consider picking one up in this capacity. Push things up to 480GB, however, and you’ll pay £121 (just 25p/GB) or $135 (28 cents/GB). Fortunately, this particular capacity has maintained its figure over the intervening weeks, making it just as great value as it was before the Christmas bloat. It’s also a useful £14 cheaper than Samsung’s market-leading 850 EVO. The BX300 is a standard 2.5in SATA3 model, so will fit in most laptops and PCs – no special M.2 motherboards required here. There’s a stick-on plastic rectangle in the box that will bump up its thickness from 7mm to 9.5mm, as some laptops have fatter drive bays, and there’s also a slip of paper suggesting you download Acronis True Image. This special, cut-down version of the software lets you clone your current Windows installation straight to the new SSD. I plugged the SSD into my test system (an AMD Ryzen 7 1800X processor plugged into an Asus Prime X370-Pro motherboard with a 16GB Crucial Ballistix Elite DDR4 RAM kit), and in a couple of clicks (well, maybe five) and a reboot, the system’s Windows installation had been copied over flawlessly to the new disk. Compared to running Windows from a hard disk, the BX300 has the same huge performance benefit as any SSD. Windows boots in seconds, as does almost any application, and you’ll never be the one holding up the start of the match in Assault Squad 2. However, to really see how this SSD stacks up against the competition, subjective impressions won’t do, so I put it through the AS SSD benchmarking tool. This has several tests, but the ones I find particularly revealing are the sequential and 4K random benchmarks. The sequential test writes and reads 1GB of data to and from adjacent locations in the SSD’s memory. This is the fastest way for an SSD to operate, and sequential figures are what SSD manufacturers use to produce their claimed speed figures. Meanwhile, the 4K random test writes and reads 1GB of data in total, but the data is split into 4KB chunks that are spread all over the place. This is a much harder test for an SSD, but is closer to what a drive has to do during normal operation – Windows itself is forever reading and writing tiny bits of data, so a good result in the 4K random test is indicative of strong Windows and application performance. The final test I ran is also important: response time. This is the interval between a request for data being sent to the drive, and the drive starting to do something about it. This is measured in milliseconds and, naturally, the lower, the better. The results show the BX300 taking the fight to Samsung’s 850 EVO and then some. Crucial’s drive was quicker in the sequential tests, with 526MB/s read and 476MB/s write, compared to the 850 Evo’s 498MB/s and 453MB/s. In the challenging random 4K test, the BX300 was much quicker in the write test, with 74MB/s compared to 64MB/s, but a fair bit slower when reading random 4K data; the Crucial BX300 scored 28MB/s in this test, while Samsung’s 850 EVO managed 35MB/s. The Samsung drive has impressive response times of 0.055ms to start reading and writing data. Crucial’s BX300 can match this for reading data, but will take 0.08ms to start writing. That might not seem like a big difference, but these are nevertheless some strong results. The Samsung 850 EVO’s faster 4K write and response times may lend it an edge in Windows performance, but I’m splitting hairs here. There’s also the fact that the 850 EVO Katharine tested was a 500GB model, and larger SSDs are often faster, as they have more flash memory chips to access at the same time. Crucial does have a trick up its sleeve, however. If you install the Storage Executive software, you can turn on Momentum Cache. This stores random data due to be written to the SSD in your system RAM, then dumps it to the SSD as a far faster sequential write. The Cache pushed the 4K random writes test up to a huge 229MB/s, but does come with a caveat: if the power goes out before the cached data can be written to the SSD, there’s a chance Windows will break. For this reason, the software recommends in large, BOLD LETTERS that you have a battery back-up. Ultimately, though, the Crucial BX300 makes a good impression. It’s not quite as quick as the Samsung 850 EVO, aka the SSD everyone buys, but it’s almost there and is helpfully a little cheaper. A great-value SSD. Tagged with Crucial, feature, Hardware, ssd, SSDs.